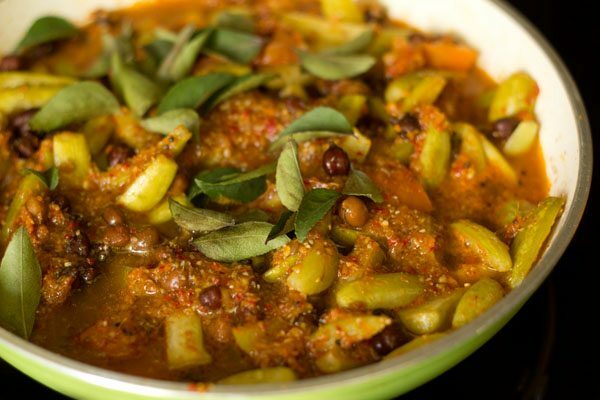 mangalorean style ivy gourd & brown chickpea curry made with roasted ground spices and fresh coconut. mangalorean kadle manoli recipe with step by step photos – this recipe is also known as manoli kadle in tulu language. 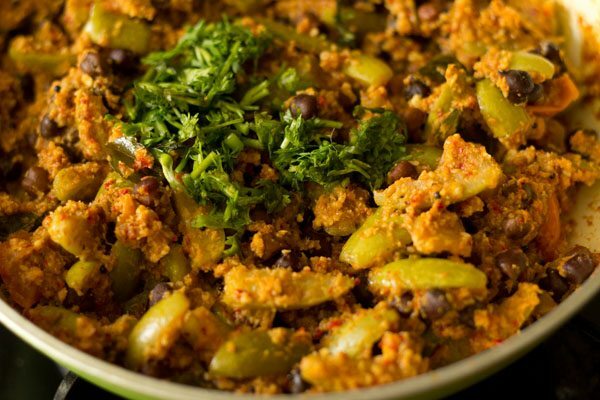 ‘kadle’ means chana or chickpeas and ‘manoli’ means ivy gourd. 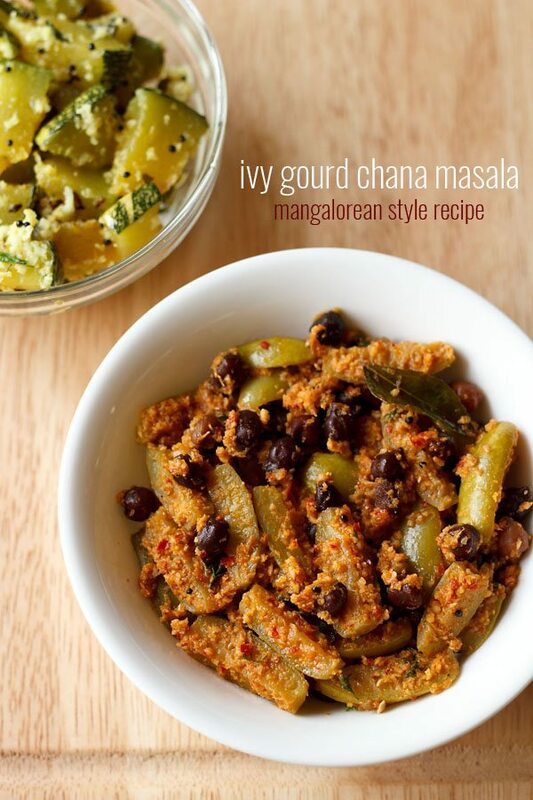 this is a mangalorean bunt recipe of ivy gourd with black chickpeas in a coconut and spice base. the recipe comes from my aunt who is from the bunt community. 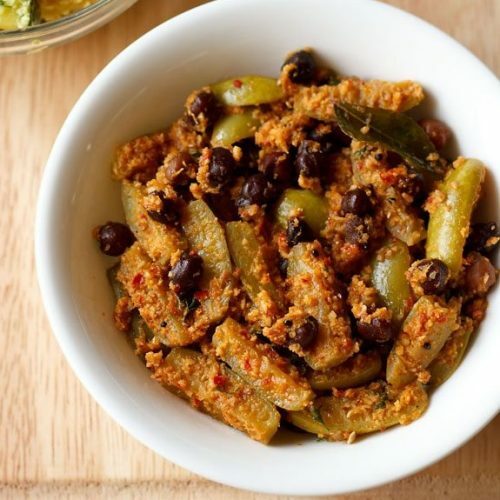 we simply love this dry dish of ivy gourds and chana with roasted ground spices and coconut. 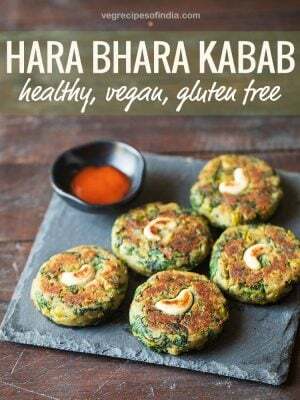 at times i make this to go with chapatis. in fact this dish used to be one of my favorite recipes served in the bunt weddings. 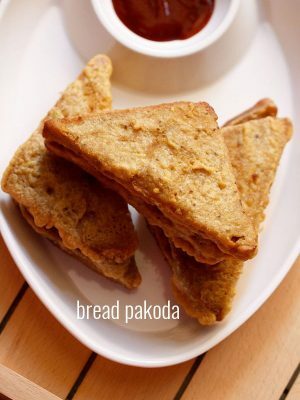 it can also be called as tindora chana sukka. 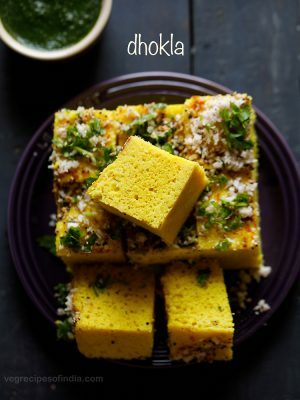 there are some intermediate steps in this recipe like cooking chana, cooking ivy gourds, roasting & grinding spices and grinding coconut. so make everything and then start with the cooking of the curry. 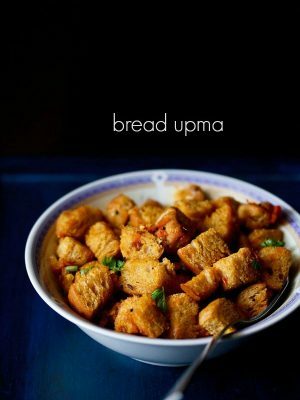 instead of brown chana, you can also use safed chana or white chickpeas. 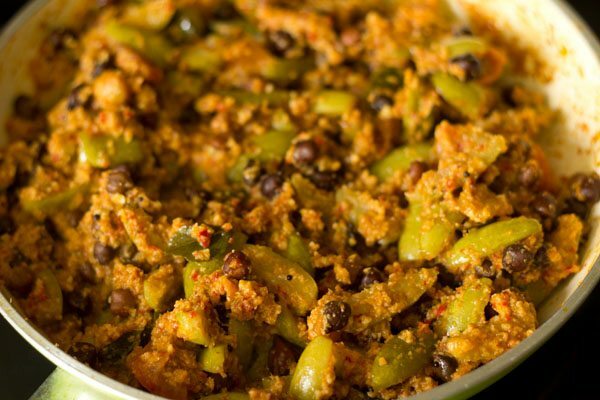 this ivy gourd chana curry can be served with rotis and even rice. 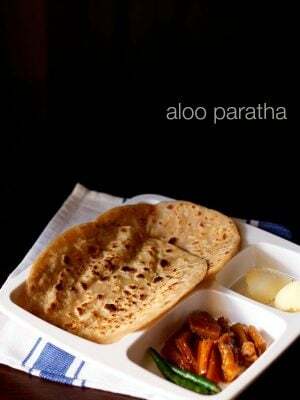 you can also serve it with set dosa or neer dosa or malabar paratha. try this recipe and let me know how it goes for you. 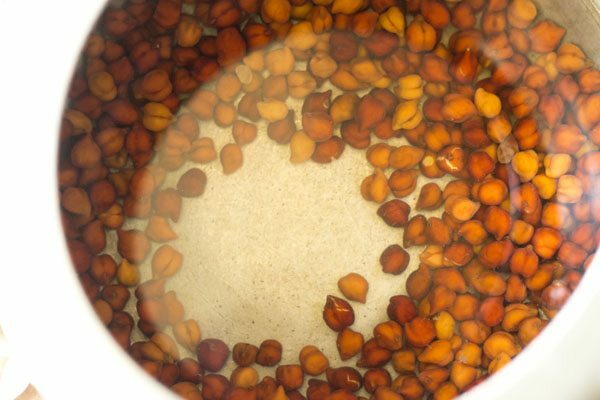 you will need to soak 1/4 cup heaped black chana/brown chana in enough water overnight. then next morning, drain all the water from the brown chickpeas. add the soaked chana and 1.5 cups water in a pressure cooker. you can add 1/4 teaspoon salt if you want. pressure cook on medium flame for 17 to 18 whistles or 16 to 18 minutes till the chana is cooked well. when the pressure settles down on its own in the cooker, remove the lid and check the chana. you can press them or take a bite. they should be softened and should not have any bite in them. strain the chana and reserve the stock. meanwhile when the chana is cooking, rinse 200 grams tendli and slice them vertically into 2 or 4 pieces. if the tindora is small, slice in two and if medium to big, slice in four pieces. 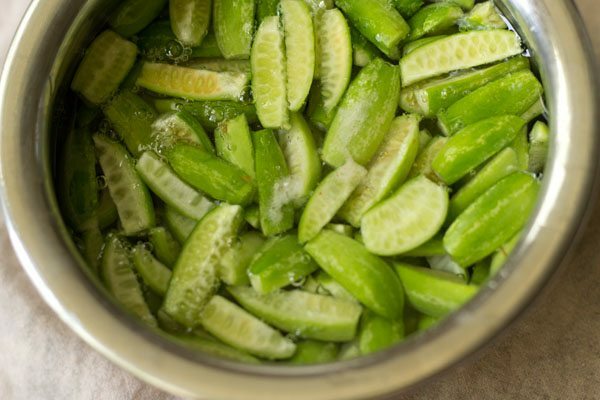 now take the sliced tindora along with 1 cup water in a small pan. add a pinch of salt. keep the pan on a stove top. cook on medium flame till the tendli is cooked. 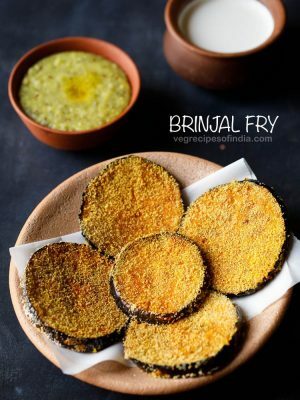 do not overcook as then the tendli will become mushy. once done, strain and keep the water in which the tendli was cooked. keep the cooked tendli aside. now heat another small pan. 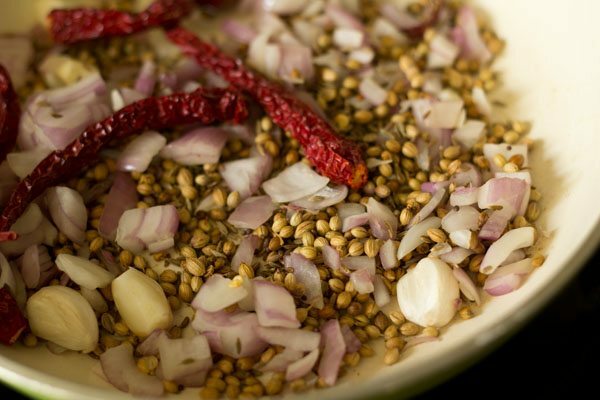 keep the flame to a low and add 2 tablespoons coriander seeds, 1/2 tablespoon cumin seeds, 1/4 teaspoon mustard seeds, 1/4 teaspoon fenugreek seeds and 4 to 5 dry red chilies. roast for a couple of minutes, till the coriander, cumin and fenugreek seeds become aromatic. then add 1/3 cup roughly chopped onion, 4 to 5 garlic cloves (chopped). roast for 5 to 6 minutes. keep on stirring at times while roasting. let this masala cool down. then add the roasted masala in a grinder jar. also add 1/2 teaspoon tamarind. i did not have tamarind, hence did not add. thus i added 1 tomato later while sauteing. add 1/4 to 1/3 cup of water and grind to a coarse paste. don't make a smooth paste. remove the masala paste in a bowl and keep aside. 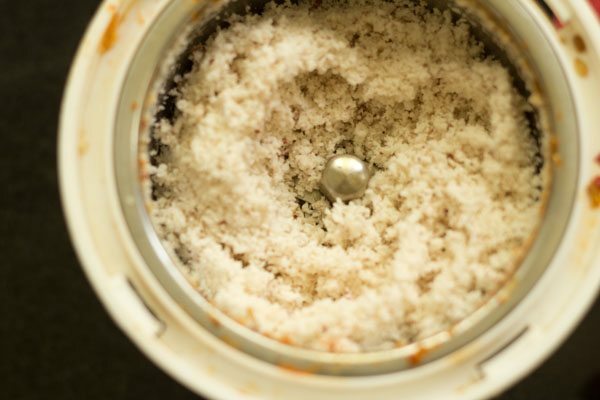 in the same grinder jar, add 1/2 cup grated coconut. without adding any water, pulse the coconut a few times. just pulse to get a coarse texture in coconut. do not pulse or grind till fine. keep the coconut aside. heat 2 to 3 tablespoons oil in a pan. add 1/2 teaspoon mustard seeds and let them crackle. now add the coarsely ground masala paste. next add tomatoes. 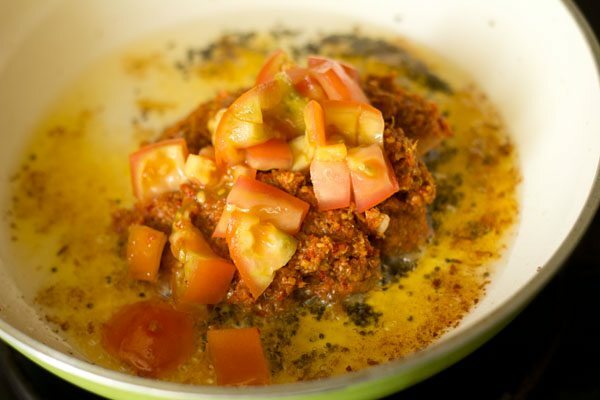 tomatoes are used as a substitute for tamarind. if you have added tamarind while grinding the masala paste, then do not add tomatoes. stir very well and saute for a minute. then add the cooked kala chana and the cooked tindora. mix very well and then add 2 sprig of curry leaves. stir again. now add 1/2 to 2/3 cup of water. 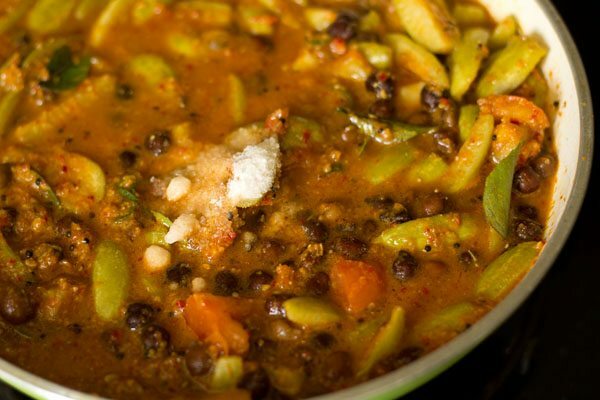 if you have the ivy gourd stock and chana stock, then add that instead of water. i added both the ivy gourd and chana stock with a bit of water. also add salt. mix very well. 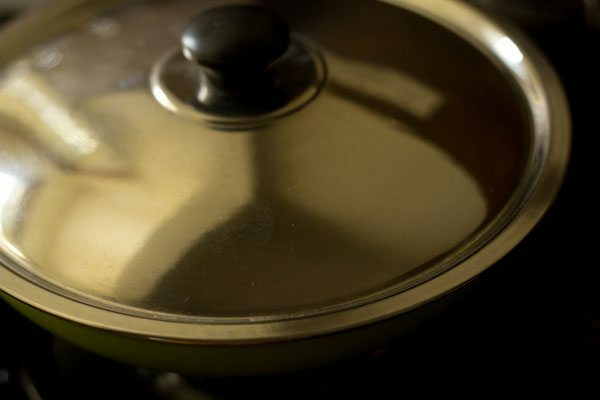 cover the pan with a lid and simmer on a low flame for 9 to 10 minutes. then remove the lid and add the coconut. mix very well. simmer without a lid stirring at intervals for 4 to 5 minutes on a low flame. simmer till you get a dry mixture. you can also have a semi dry gravy. lastly add 2 tablespoons chopped coriander leaves and mix. switch off the flame. 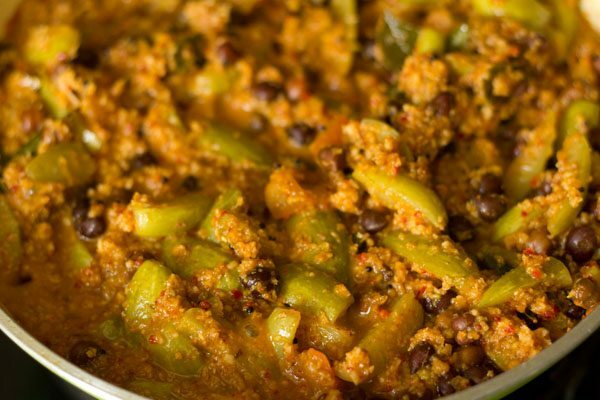 serve ivy gourd chana curry with chapatis or rice. - curry can be made into a dry consistency or semi dry consistency. 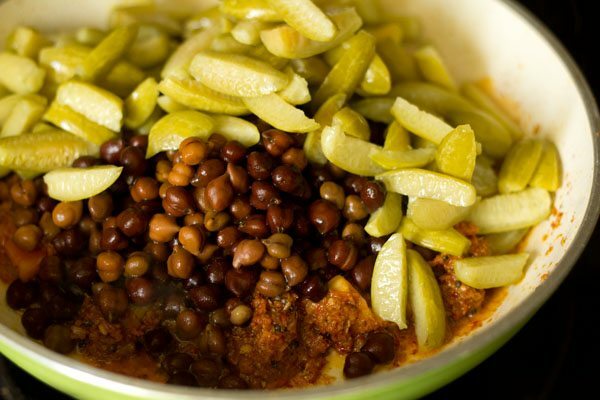 - instead of black or brown chickpeas, you can also use white chickpeas. 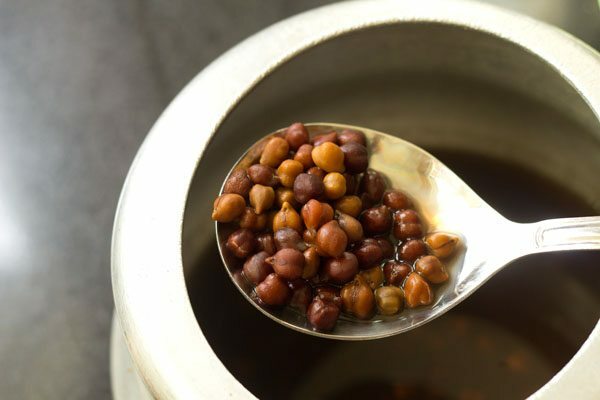 1. you will need to soak ¼ cup heaped black chana/brown chana in enough water overnight. then next morning, drain all the water from the brown chickpeas. 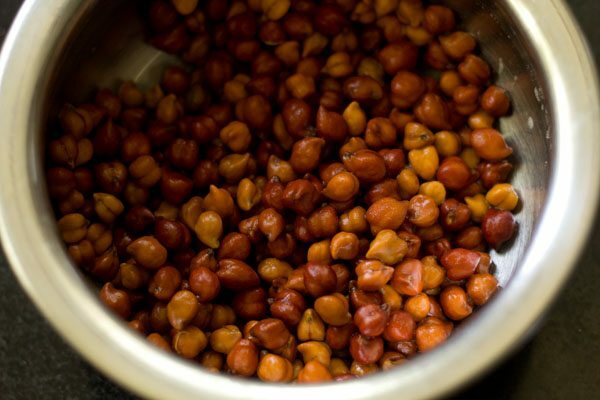 2. add the soaked chana and 1.5 cups water in a pressure cooker. you can add ¼ teaspoon salt if you want. 3. pressure cook on medium flame for 17 to 18 whistles or 16 to 18 minutes till the chana is cooked well. when the pressure settles down on its own in the cooker, remove the lid and check the chana. you can press them or take a bite. they should be softened and should not have any bite in them. strain the chana and reserve the stock. 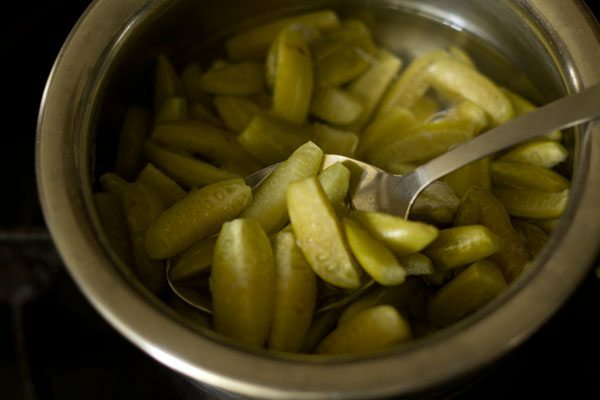 4. meanwhile when the chana is cooking, rinse 200 grams tender tindora/ivy gourds. slice thinly and discard both the ends. then slice them vertically into 2 or 4 pieces as shown in the pic. if the tindora is small, slice in two and if medium to big, slice in four pieces. 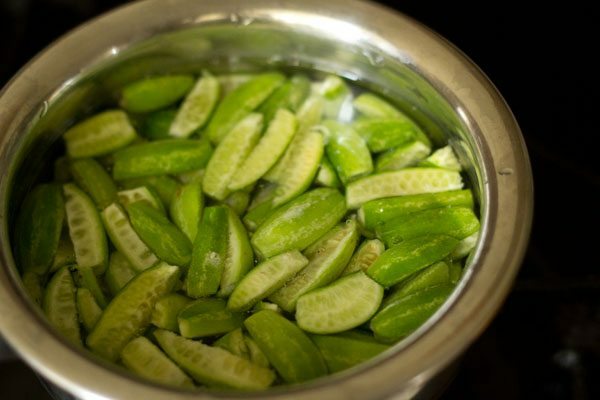 5. now take the sliced tindora along with 1 cup water in a small pan. add a pinch of salt. 6. keep the pan on a stove top. 7. cook on medium flame till the tendli is cooked. do not overcook as then the tendli will become mushy. 8. once done, strain and keep the water in which the tendli was cooked. keep the cooked tendli aside. 9. now heat another small pan. 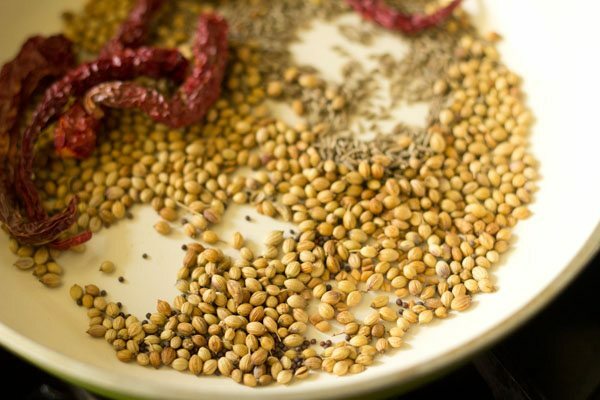 keep the flame to a low and add 2 tablespoons coriander seeds, ½ tablespoon cumin seeds, ¼ teaspoon mustard seeds, ¼ teaspoon fenugreek seeds and 4 to 5 dry red chilies. 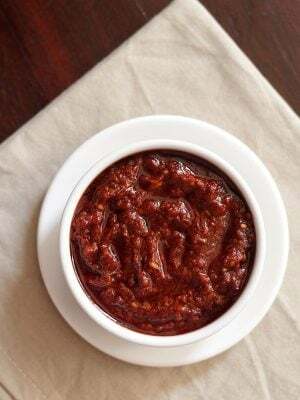 you can use byadagi red chilies or kashmiri red chilies. 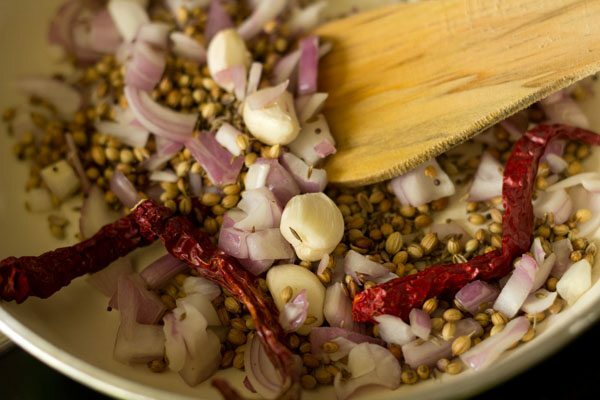 10. on a low flame, roast for a couple of minutes, till the coriander, cumin and fenugreek seeds become aromatic. then add ⅓ cup roughly chopped onion, 4 to 5 garlic cloves (roughly chopped). 11. roast for 5 to 6 minutes. keep on stirring at times while roasting. 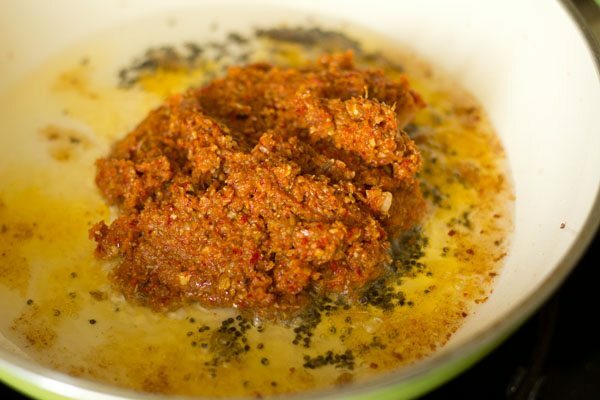 12. let this masala cool down. 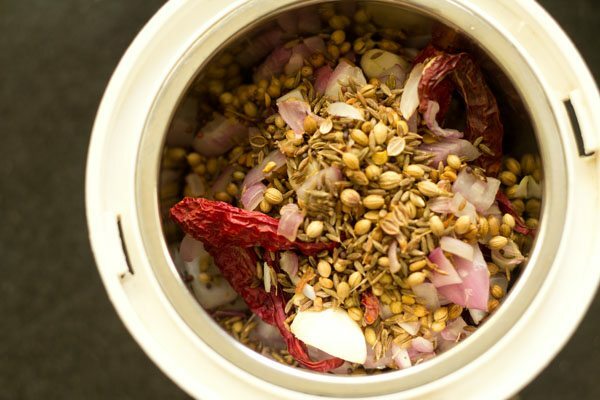 13. then add the roasted masala in a grinder jar. also add ½ teaspoon tamarind. i did not have tamarind, hence did not add. thus i added 1 tomato later while sauteing. 14. add ¼ to ⅓ cup of water and grind to a coarse paste. don’t make a smooth paste. 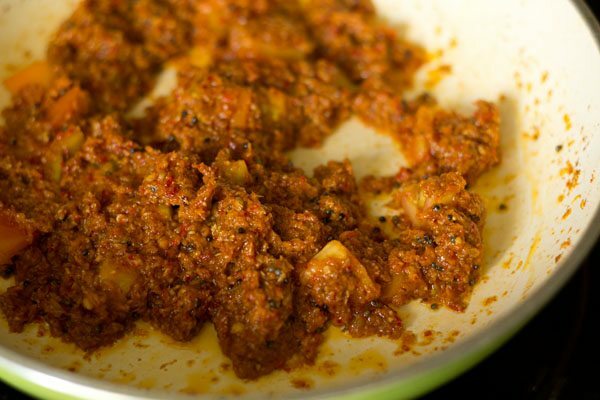 remove the masala paste in a small bowl and keep aside. 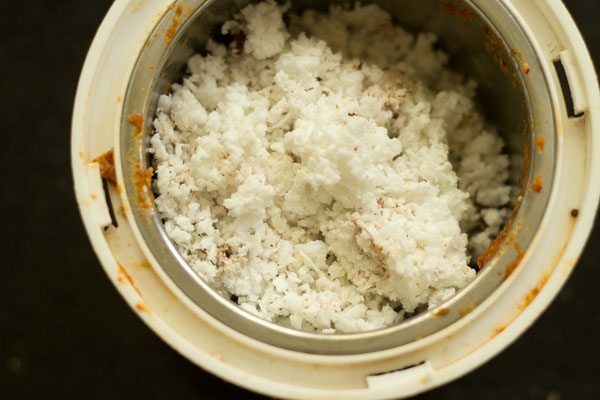 15. in the same grinder jar, add ½ cup grated coconut. 16. without adding any water, pulse the coconut a few times. just pulse to get a coarse texture in coconut. do not pulse or grind till fine. keep the coconut aside. 17. heat 2 to 3 tablespoons oil in a pan. 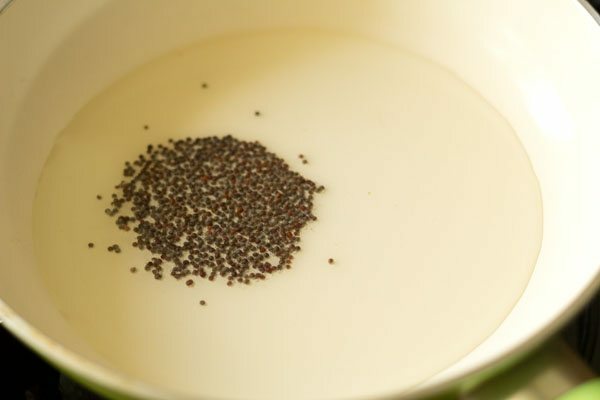 add ½ tsp mustard seeds and let them crackle. 18. now add the coarsely ground masala paste. 19. next add tomatoes. tomatoes are used as a substitute for tamarind. 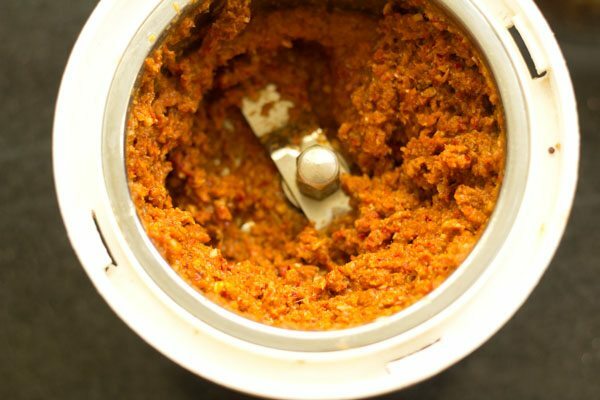 if you have added tamarind while grinding the masala paste, then do not add tomatoes. 20. stir very well and saute for a minute. 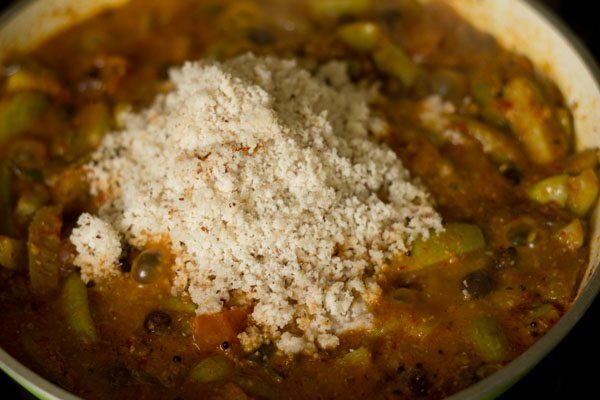 21. then add the cooked kala chana and the cooked tindora. 22. mix very well and then add 2 sprig of curry leaves. stir again. 23. now add ½ to ⅔ cup of water. 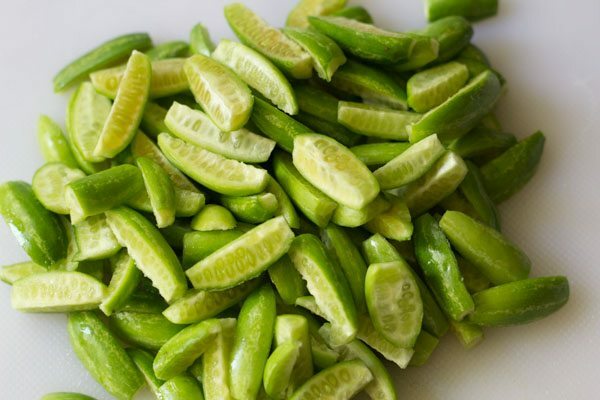 if you have the ivy gourd stock and chana stock, then add these instead of water. i added both the ivy gourd and chana stock with a bit of water. also add salt. 24. mix very well. cover the pan with a lid and simmer on a low flame for 9 to 10 minutes. do check once or twice to see if the gravy is not getting stuck or browned at the bottom of the pan. 25. afterwards remove the lid and add the coconut. 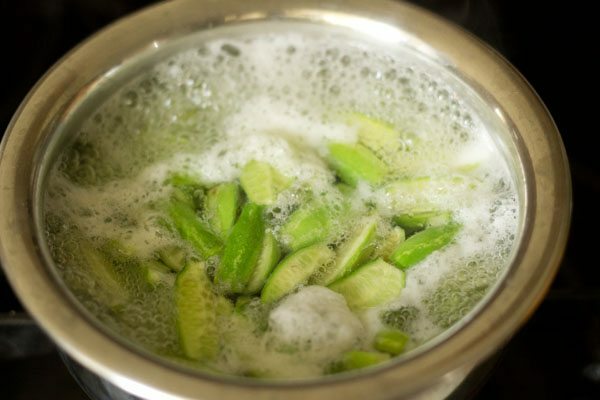 27. simmer without a lid stirring at intervals for 4 to 5 minutes on a low flame. simmer till you get a dry mixture. you can also have a semi dry gravy. 28. switch off the flame. then add 2 tablespoons chopped coriander leaves and mix. 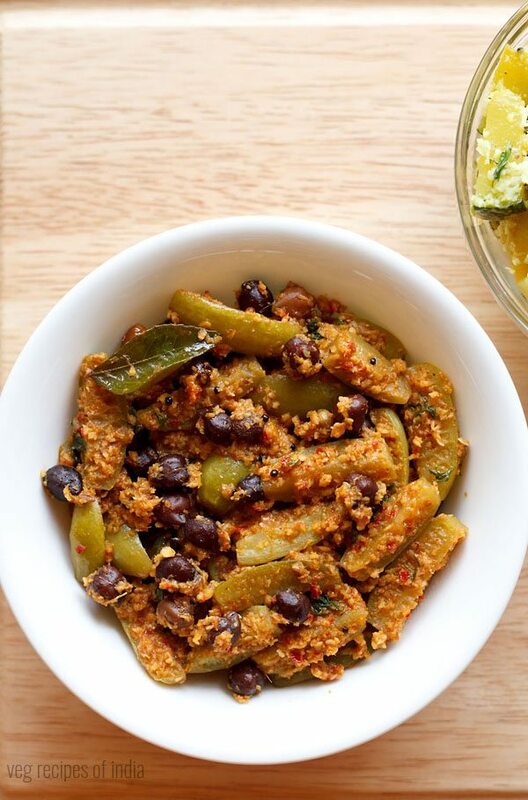 29. serve ivy gourd chana curry with chapatis or rice or poori. Tried this today and came out really well! Thanks for sharing! made this but for some reason it came out too coridaner-ee. i.e. i could feel the coriander seedswhen I eat. i guess i screwed it up. the dish does not taste too much of coriander. 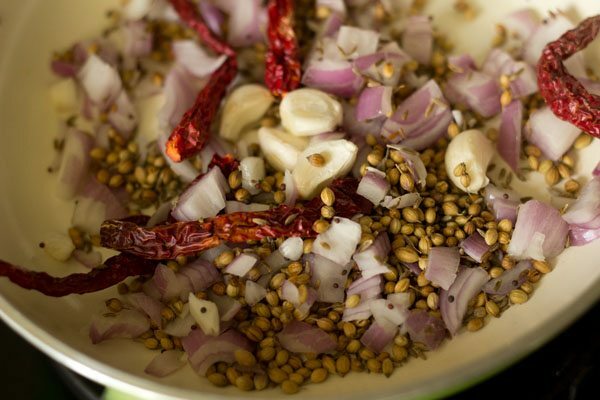 the coriander along with the other spices need to be ground coarse, but not too coarse. the seeds should like tiny grits but there should be no coriander halves in the paste. hope this helps. Nice recipe. Tried today. Come out well..
Thnk u for sharing such a wonderful recipes. Keep it up.. ?? Thanks for the dish.. Came out well today. Keep up the good work.. Tried it today.. Came out well ? thank you dasanna for reminding me as to how much I love this dish. your blog is really is a blessing for so many of us vegetarians who do not have daily access to mom’s food. Can we skip the coconut? coconut is one of the main ingredient in this recipe. you can use desiccated coconut instead of fresh coconut. welcome lorraine happy to do this 🙂 thankyou so much.